House purchase is the most tedious process where numerous factors are involved, e.g., locations, built-in, number of bathrooms/bedrooms, etc. Many websites, such as Trulia, provide detailed information of available houses on the market, including house status that whether a house is still available or under a contract. Therefore, we can use the house status as the label to see what other possible factors can influence the decision of house purchases. To start with, we need the data. Here is a python script that can help you extract the information of houses in your area from Trulia with Beautiful Soup. 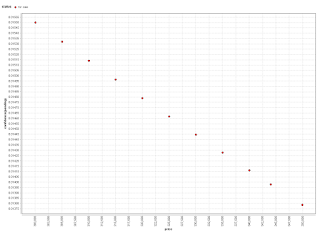 The next step is to prepare the data for training. 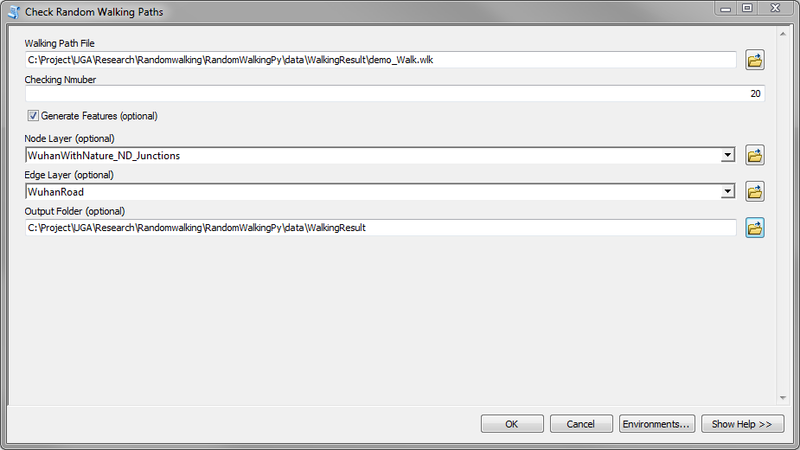 Because we are using Rapidminer, we have to import the collected data from Access table to Rapidminer. In the data preparation step, we filtered unnecessary information, such as MLS ID, URL of each house, etc. We then changed the status of for sale by owner to for sale so that there are only two status: for sale and pending (i.e., under a contract). We set the house status as the label, namely the target we want to predict, and exclude some features of houses that are not common, e.g., has a lawn or has a pond. The next question is: which model to use? MOD is a very useful website that can recommend a set of models based on the data type and size of the data. In our situation Decision Tree, Naive Bayes, k-NN, Random Forest, Deep Learning and Generalized Linear Model are recommended. 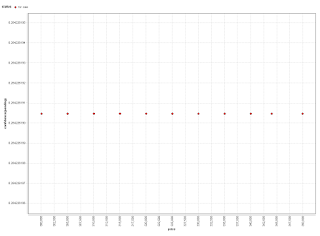 We can the compare the accuracy of those models using Compare ROCs Operator in Rapidminer. 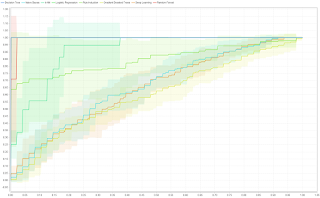 The results of Decision Tree and Random Forest are unrealistically accurate, followed by Rule Induction and Logistic Regression models. The most pending houses are predicted as pending with higher confidence, and some for sale houses are also predicted as pending with relative low confidence. Those for sale --> pending houses may have the potential and worth of special investigation. Also most of the for sale houses are predicted as for sale. Finally, we can apply our models by feeding the specific house that we might be interested. We also created a set of records for the same house with different prices to see if price decline can influence the purchase decision. All the models predicted that this houses, although with declined prices, should always be for sale, namely should not be considered. Specifically, Decision Tree model gives less than 28% confidence that this house will become sold, and the confidence is not sensitive to prices. Twitter users can mention or reply other Twitter users in each single tweet. Visualizing those online interactions on Twitter provide better understandings of human online behaviors, such as identifying who are the most important information source, and how information is transmitted online, and etc. To visualize Twitter users online interactions, we have to extract tweets, and separate the mentioned/ replied users from the tweet texts. 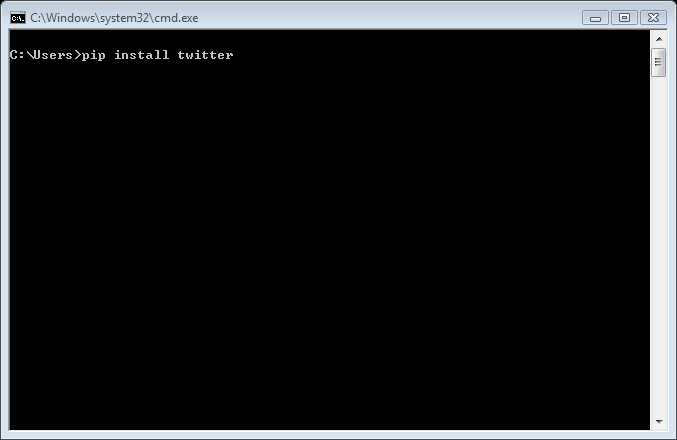 This Python script uses Twitter REST API can extract mentioned/ replied users from tweets, and store the results in a CSV file. 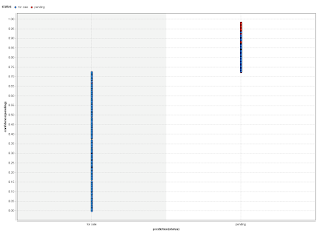 To maximize the usage of the REST API, the since_id and max_id are used to retrieve more tweets from a single Timeline. 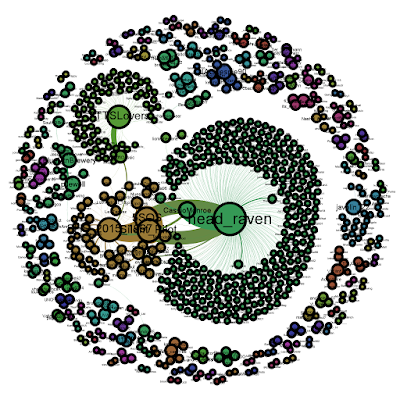 Once the mentioned/ replied users are separated, we can use Networkx to create a network graph in which the mentioned/ replied users and the author of each single tweet are connected. 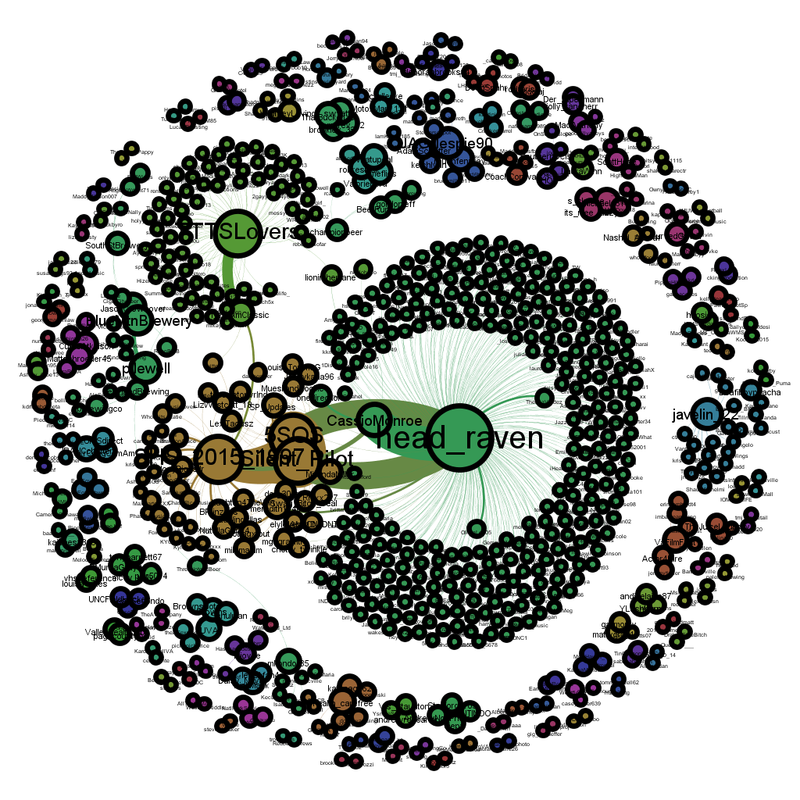 This created network can be exported into Gephi for further visualization and analysis. A simple script is available here. 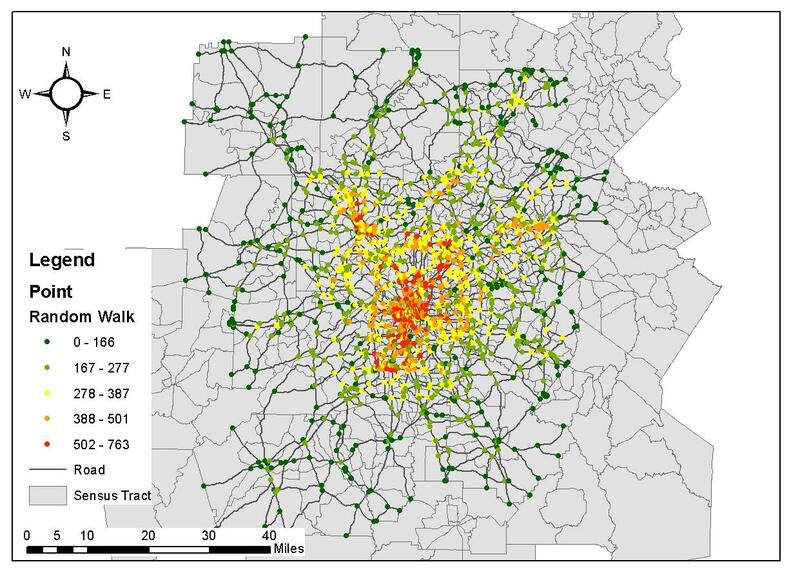 A recent study found that Random Walk algorithm can be utilized to rank spatial importance of road networks. 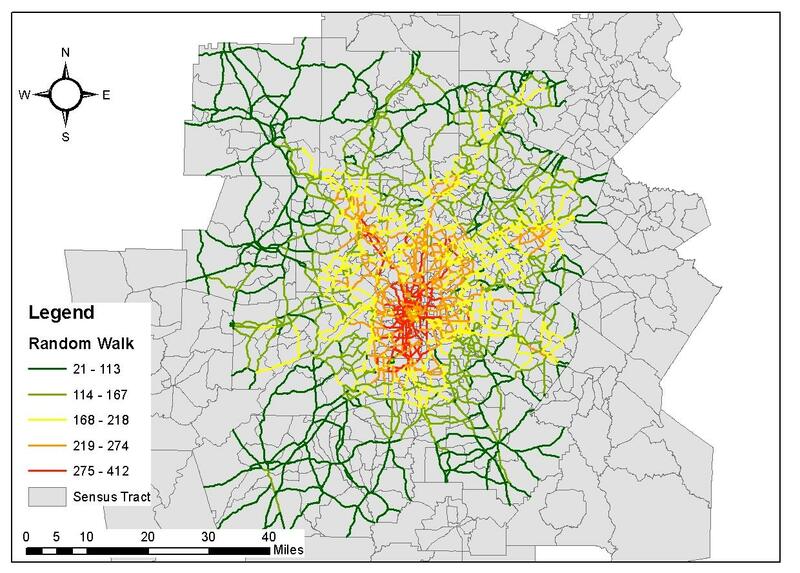 The basic idea is that by simulating a person's random walking in a road networks, the road segments or interactions that have been walked through many times are considered spatially important. 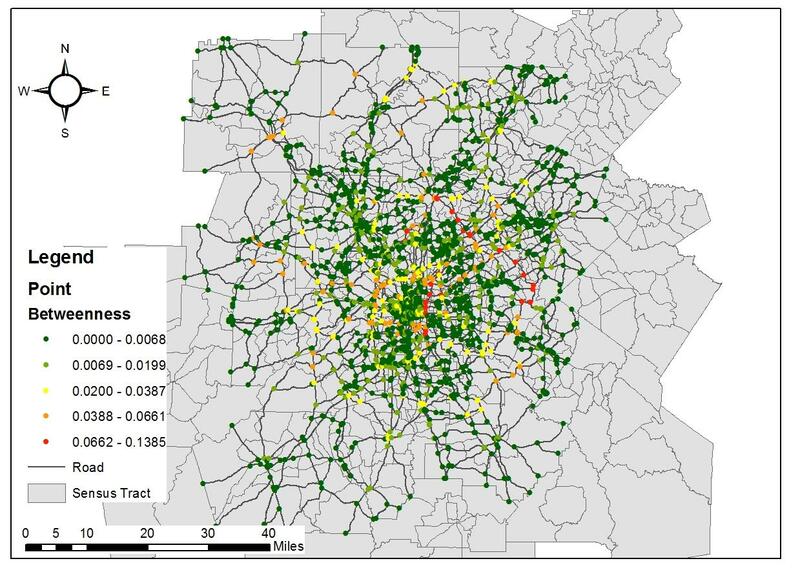 Such spatial importance of road networks is evidenced in their close correlation to some social-economic characteristics of surrounding urban areas structured by road networks, e.g., population density, job density, or even house prices. 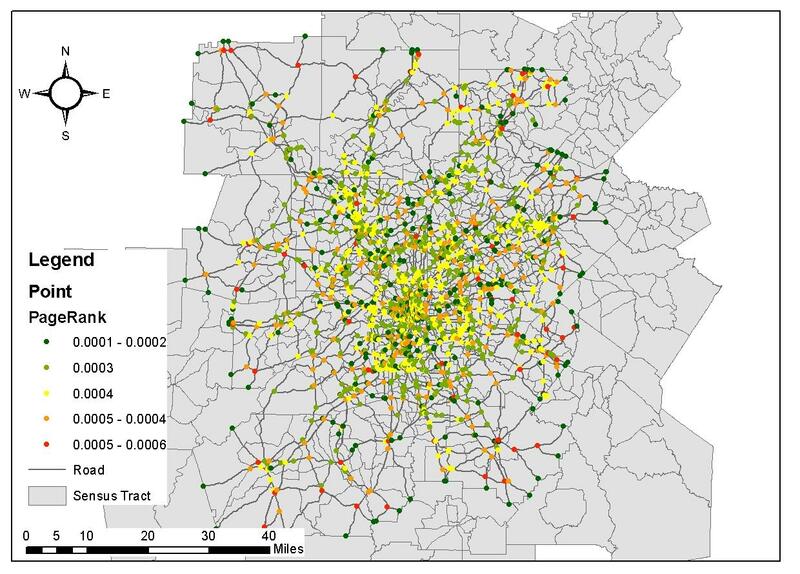 More details can be found at this article: The Random Walk Value for Ranking Spatial Characteristics in Road Networks. An ArcGIS Tool has been devised to implement this Random Walk simulation. Open a road network shapefile in ArcGIS. 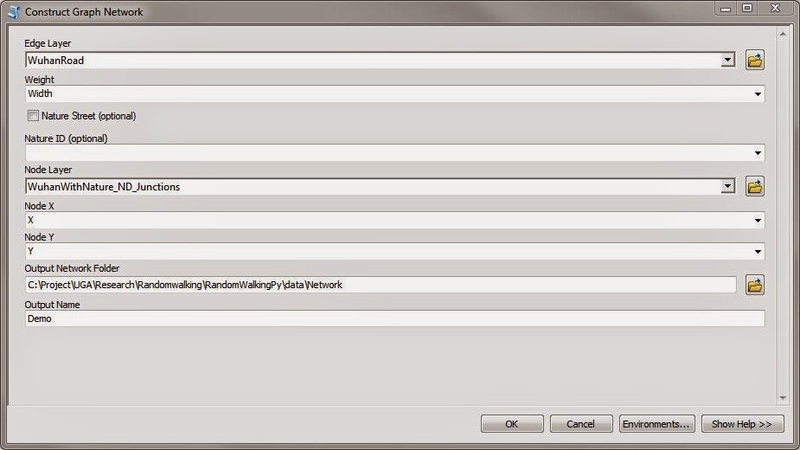 Open Construct Graph Network tool in the ArcGIS tool box, select the road shapefile as the edge layer. The weight field can be any numerical attributes of a road network, such as width, design speed and etc. 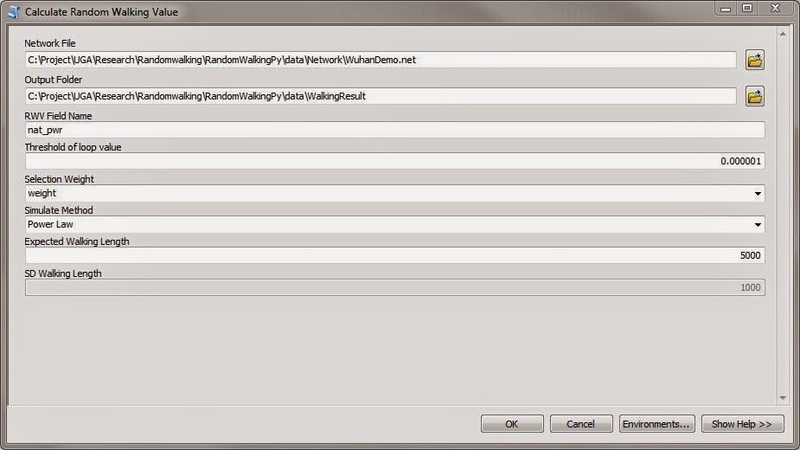 In the node layer field, select the nodes that will be included in the random walk simulation, such as bus stops. Select the X and Y coordination of the node layer, and define the output folder and network name. This tool will create a graph object. 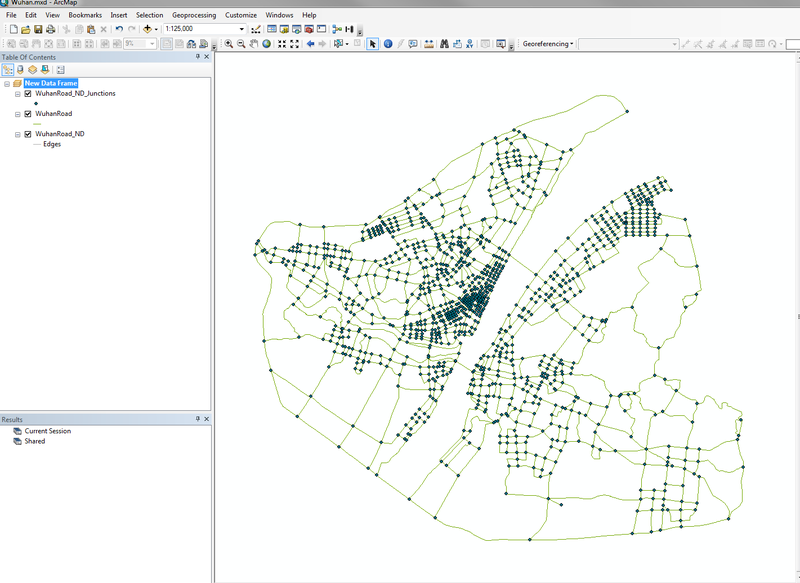 If you don't have specific road nodes or you want to include all the road junctions in the random walk simulation , you can create road nodes by adding a network dataset of the road shapefile in ArcGIS. 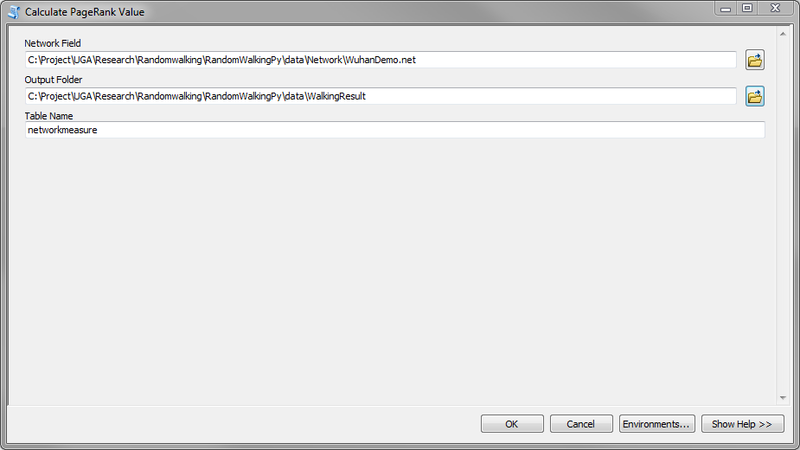 Open the Calculate Random Walking Value tool in the ArcGIS toolbox, select the created graph in the Network File field. Define the output folder, field name, threshold of loop value, weight, and simulation method of the random walk simulation. 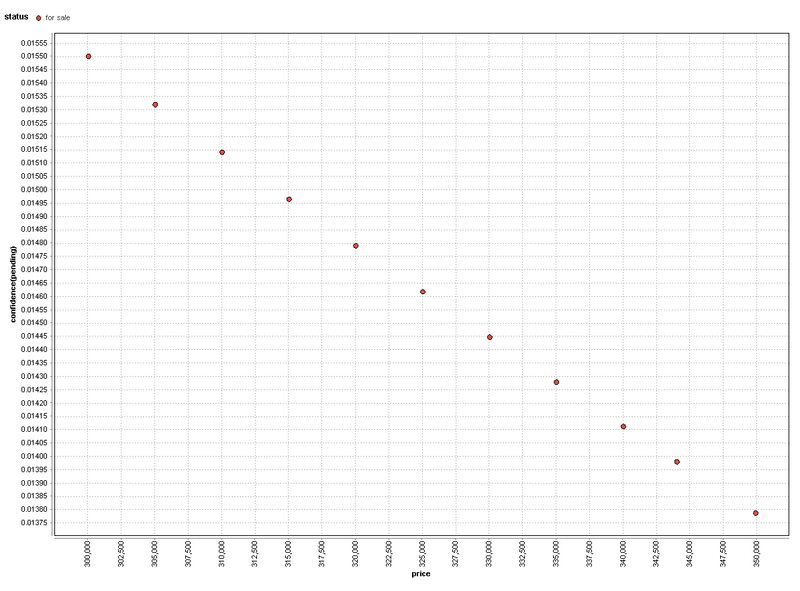 The definitions of those parameters can be found in the The Random Walk Value for Ranking Spatial Characteristics in Road Networks. 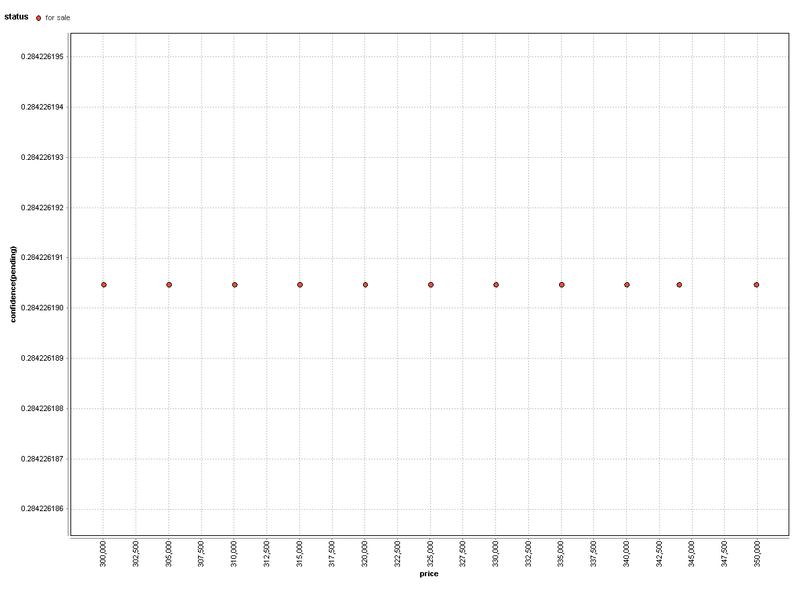 Random walk simulation may take several minutes. After the calculation is done, you can import the calculated edge and node shapefile in ArcGIS. A wlk files recording the walking paths is also created in the defined folder. You can visualize the simulated random walk paths in ArcGIS by using the Check Random Walking Paths tool. In the Check Random Walking Paths tool, select the created wlk file in step 3, define how many walking paths you want to check, and define the output folder if you want to visualize those walking paths as shapefiles. This tool can also calculate other network measures such as PageRank, betweenness, closeness and etc. To do that,open the Calculate PageRank Value tool in the ArcGIS toolbox, select the create network graph in the step1, and define the output folder of the network calculation. The network measures will be saved in a table in the defined folder.